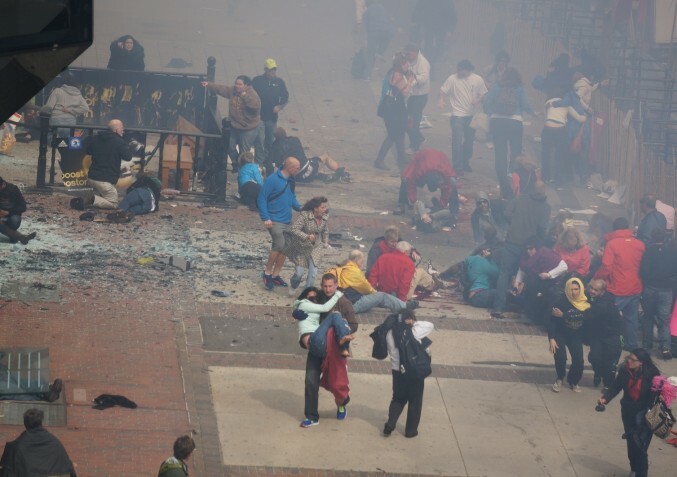 The people trying to ‘crowdsleuth’ Monday’s blasts are part of a cottage industry. In the age of the Internet, Amber Alerts and TV shows such as America’s Most Wanted, many people with no connection to law enforcement devote countless hours to trying to solve crimes… Groups of amateur sleuths […] have helped solve dozens of missing person and murder cases, poring over old records. Our expectation of a horrific crime like this being solved is higher than it was in the past because of the ubiquitous nature of the collecting of images… Invariably, it’s the tips and the help that is provided by the public that results in the solution of most of our cases today. With the online communities of 4Chan, an image sharing community and Reddit, a social bookmarking community, a group of people have been contributing and further promoting this on Facebook, helping solve the Boston Marathon Explosion crime. The main images were posted on imgur, an image sharing site. Between the government’s own surveillance cameras and the digital appliances of citizens, the authorities had over a million images to look at, and 1,000 hours of video footage. This abundance could easily become a case of Too Much Information. Not in the sense that it is unseemly or embarrassing, but in the sense of system overload. The IBR plan considers your adjusted gross income, the size of your debt and the size of your family—and may lower your monthly loan payments. And if you work in the public or nonprofit sectors, the teachers and instructors loan forgiveness programs may cancel your remaining debt (principal and interest) after 10 years and 120 qualifying payments. In a survey by LexisNexis Risk Solutions, they found that 4 out of 5 people in law enforcement agencies use various social media platforms to assist investigations. 67% honestly believe social media does help solve crime and 85% of the time search warrants using social media to establish probably cause hold up in trial courts when challenged. And this is of course the very thing that worries a lot of Americans. The total surveillance society is no longer a gleam in some dictator’s eye. It is upon us. Last week, we mentioned that one of the conspiracy theories is that the government holds onto certain key pieces of legislation and waits for something all-absorbing to happen in the news. Then the extremely objectionable law is quietly passed. In this case, that law looks to be CISPA, the Cyber Intelligence Sharing and Protection Act, which opponents say opens the door for privacy invasion on a massive scale. The Daily News edited that photo out of sensitivity to the victims, the families and the survivors. There were far more gory photos that the paper chose not to run, and frankly I think the rest of the media should have been as sensitive as the Daily News. This is a test case in terms of electronics and amateur sleuthing. If they can find the lead that leads to the perpetrators, it will be a new standard of law enforcement. The New Statesman went as far as to call it a ‘racist Where’s Wally’, with the suggestion that there was emphasis on pointing out non-whites among the crowds. A young man who has been missing for several weeks was misidentified and apologized to. Some other folks now fear for their lives, as the potential for vigilante action still exists. As soon as the FBI had the officially real suspects, the Reddit moderators directed users to delete any pictures that weren’t them. It can’t be more than a gesture, since copies could exist in the millions. Lee quotes some very upset Reddit users about how bad the outcome was. He also quotes Charlie Beckett, of a think tank called POLIS, who suggests that the unfortunate mistakes turn out to provide a “media literacy seminar” that will help us do better next time. We would be curious to hear your opinion about the use of real-time media in solving breaking cases. Do you think it will eventually lead to more problems than it solves? Image by Aaron “tango” Tang.